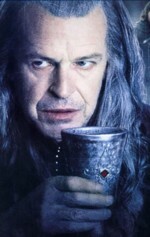 John Noble plays Denethor, father of Boromir and Faramir, and Steward of Gondor. Producing over 70 new Australian plays; 240 performances of Ron Blair’s one man play ‘The Christian Brothers’; commissioning and directing the enormously successful Percy and Rose for the 1982 Adelaide Festival of Arts and subsequent National tour; and producing four major pieces for the 1984 Festival of Arts, including the memorable Masterclass. He served an eight-year term as a Trustee of the Adelaide Festival Centre. In that time he was associated in the Australian productions of Cats and Les Miserable. He was chairman of the inaugural Australian Drama Festival in Adelaide in 1982, and was a foundation member and chairman of the Association of Community Theatres. In 1984 the Premier of S.A., Mr. John Bannon nominated him as Young Australian of the Year for his work in the Arts. John is now Head of Drama at Brent Street School of Arts. He has conducted master classes at N.I.D.A., Flinders University, the R.A.A.F., The Centre for Performing Arts, Carclew Youth Drama Camps, the S.A. Education Department, the National Book Council and the NSW & ACT Writers Centres. He has a private teaching studio specializing in presentation skills, accent modification, and film and TV performance and audition preparation. As an actor, he has had guest roles in TV series Big Sky, Police Rescue, Water Rats, Timetrax, and Above the Law and Tales of the South Pacific. For the last two and a half years he has a semi-regular role in All Saints as the Neuro-Surgeon Dr John Madsen. He appeared in the mini-series Hills End, and films The Dreaming, Nostradamus Kid, A Sting in the Tail and Call me Mr. Brown. In 1999 played Sorrentino in the tele-movie Airtight, and Mr. Norris in the feature film The Monkeys Mask. In 2000 he played a support lead in the tele-movie A Virtual Nightmare. He will play Denethor in two films in The Lord of the Rings Trilogy.